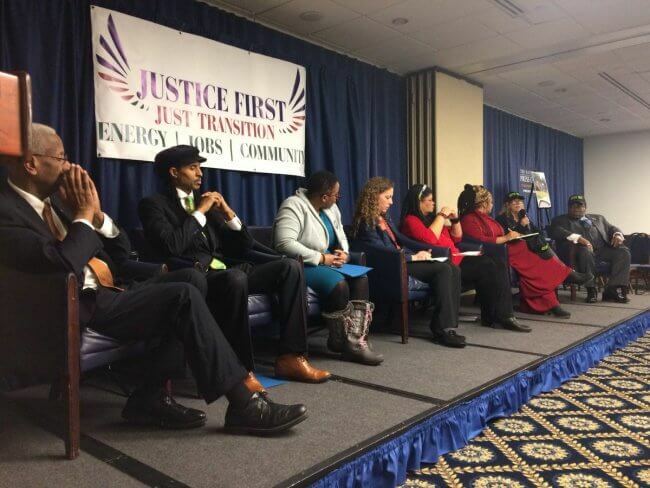 This month, Dogwood Alliance joined Reverend Leo Woodberry and 20 justice leaders and activists from the Justice First Campaign to bring our shared vision of forest protection, clean energy, and climate justice to our nation’s capital. Our message was clear: it’s time for a just solution to the climate crisis. Last year, many of you joined us along the way when the Justice First Tour traveled to 12 states to build solidarity across the South around climate justice. Dogwood Alliance partnered with Reverend Leo Woodberry of the New Alpha CDC and the Sierra Club Ready for 100 Campaign, along with dozens of local partners, to share our unified call for 100% clean energy for all, forest protection, and a just transition to a new green economy. As I rode the train from Raleigh to DC and watched the landscape get snowier, I knew the time was ripe for the DC edition of the Justice First Tour. Climate change is the civil rights issue of our day. That’s why we stormed Congress with our calls for leaders to put Justice First. Even when (and especially when) the government is in dysfunction — when disaster relief programs are running out of funds, when immigration courts are closed, when wildfire planning is on hold and remediation of Superfund sites is halted, Dr. Martin Luther King, Jr.’s 90th birthday reminded us that we need to hold leaders accountable to climate action and environmental justice. Our first stop was the National Press Club, where Dogwood’s Danna Smith spoke at a press conference hosted by Congressman McEachin (Virginia’s 4th district), alongside our climate champion friends at Hip Hop Caucus, WE ACT for Environmental Justice, Sierra Club, Mom’s Clean Air Force, US Climate Action Network and New Alpha CDC. A powerful lineup for the Justice First Press Conference on January 15th. From left to right: Congressman McEachin (VA-04), Mustafa Santiago Ali of the Hip Hop Caucus, Kerene Tayloe of WE ACT for Environmental Justice, Molly Rauch of Mom’s Clean Air Force, Leslie Fields of Sierra Club, Ife Kilimanjaro of USCAN, Danna Smith of Dogwood Alliance, and Reverend Leo Woodberry of New Alpha CDC. Followed by two congressional briefings that took deeper dives on the issues of environmental justice and clean energy, our group of lawmakers, activists, and advocates came together to speak truth to power. As he often did across the South at Justice First Tour stops, Reverend Woodberry closed out the press conference with a call and response with the audience. The room reverberated with calls for “Justice First!” — which probably doesn’t happen too often at the National Press Club (but it should). I listened to these leaders’ powerful message as I sat in the audience snapping photos and joining in the calls for Justice First, inspired by the moment we are in. Today, climate change is on the forefront of the nation’s consciousness, and we are part of a movement demanding action. And even more powerfully, Dogwood Alliance and our partners are demanding action that is just and that centers communities. There’s no time for false solutions or policies that replicate systems of oppression. We need a just solution to the climate crisis, including dramatically scaling up forest protection and transitioning to 100% truly clean, renewable energy. 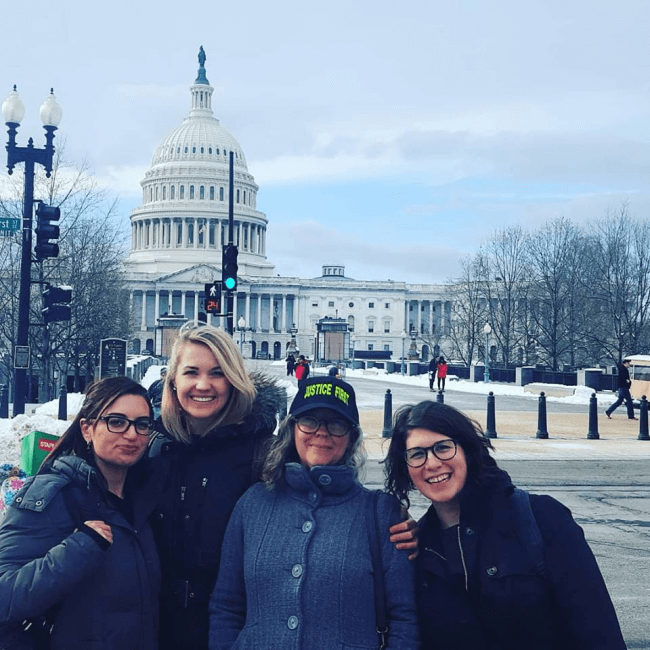 After the press conference and briefings, Danna, Rita, and I made our way Capitol Hill to meet with congressional offices and continue to spread the message of Stand4Forests and the Justice First Campaign. We put the Stand4Forests platform in the hands of several congressional offices — climate leaders in the South who want to see ambitious climate legislation at the federal level, including the office of my own representative, Congressman David Price. From long-time congressional leaders like Congressman Price (NC-04) to brand new leaders like Congresswoman Jennifer Wexton (VA-10), there was a buzz around climate action in all of the offices we visited. Congressman Don Beyer (VA-08), who has been the top leader in the house when it comes it opposing biomass, is one example: his aide made the point that champions like Beyer’s top issue has been the environment for years, and it’s about time that everyone else is talking about it. Any comprehensive climate legislation needs to include the protection of forests and wetlands, and must not include false solutions like biomass. Getting these critical pieces right is the only path forward to meeting our climate goals. Forests and wetlands are an integral part of solving the climate crisis and making our communities more resilient to the effects of climate change we’re already experiencing. As the world’s largest producer and consumer of wood products, the US has the serious opportunity — and responsibility — to protect, restore, and enhance natural forests. We made this point especially clear at Congresswoman Kathy Castor’s (FL-14) office. If you’ve been following the national headlines on climate lately, you might recognize her name — she’s the Chairwoman of the newly formed Select Committee on the Climate Crisis. We know many partners and grassroots activists will be watching closely what comes out of this committee, and we’ll be joining them in calling for the boldest, most ambitious, and most equitable solutions to the climate emergency we’re in. Regardless of committee, there’s not one representative in Congress whose constituents aren’t being affected by climate change right now — and that’s why we’re going to continue to lift up the intersection of forests, climate, and justice on the national stage. You can help grow the movement by calling your Representative and Senators and asking them to sign onto the Stand4Forests platform. With your support, we are making major progress elevating the critical role of US forests in the global effort to meet the goals of the Paris Agreement, shore up natural protection for those most directly and profoundly impacted by extreme weather events, and ensure justice and equity in the new green economy. Whether we’re in the halls of Congress, in statehouses across the South, or at the next public hearing to stop Enviva’s expansion, you can be sure we’re making our message loud and clear. It’s time to Stand4Forests and put Justice First. Watch my Instagram video where I share how this amazing trip filled me with hope and renewed purpose!